A project to help the revival of salmon on one of England’s key rivers has been officially opened by Fisheries Minister Robert Goodwill today. 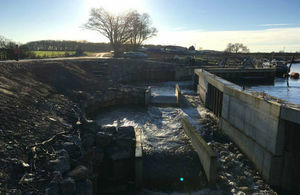 Launched in the International Year of the Salmon, the fish pass at Linton-on-Ouse, in North Yorkshire, will allow salmon and other migratory fish, including trout and eels, to bypass a weir that blocks the way to their spawning grounds. The scheme will also present a number of benefits for the local community, providing a source of green energy from the hydropower station and a new recreational facility for paddlers and canoeists. The project is a partnership between the Canal & River Trust, Linton Hydro Ltd, British Canoeing, Sport England, Nun Monkton Estate and the Environment Agency. Recent years have seen an international decline in salmon and stocks in many rivers in England are at the lowest levels on record. It is one of many schemes that the Environment Agency is undertaking nationally with partners to improve migration for salmon and boost their numbers. Improvements to water quality have also meant that the number of salmon migrating up the Humber, along the River Ouse and the River Ure to spawn has begun to increase. I was delighted to open the Linton Lock fish pass today and I would like to thank our partners for their work on finding solutions to contribute to the recovery of salmon stocks. It is only through continuing to take concerted action, and through the co-operation of others, that we will successfully protect this iconic fish for future generations. The pass encompasses state-of-the-art fish pass flights and an innovative lifting mechanism that moderates river flows to keep the route passable for fish while also benefitting recreational users of the river by creating a white water course for canoeists. A series of drops and pools have been created for paddlers to practise and compete in and it is hoped that in the near future the white-water course will host slalom and freestyle competitions, attracting recreational paddlers from all over the region. This scheme includes a new fish-friendly hydropower turbine in the form of a large, fish-friendly Archimedean screw, whose diameter of 5m (15ft) makes it the widest in the world. This innovative project was delivered by Mann Power Hydro Ltd, national hydro screw specialists who are based in North Yorkshire. This is a fantastic partnership scheme that provides many positive environmental outcomes. The hydropower station offers a source of green energy, it provides a new recreational facility for canoeists at a location close to York and fish passage for all species at no cost to the public purse. The Linton Lock scheme is expected to produce around 1,870MWh of clean electricity each year which is enough to power 450 homes. A proportion of the electricity generated will go to Widdington Grange Farm, a family-owned free range chicken farm committed to sustainable farming. British Canoeing is very proud to have been part of the development of Linton White Water Course. It will be a fantastic regional facility of national significance. Its creative design fulfils both environmental and recreational needs, allowing canoeists to come and train, compete and play. We certainly hope that this concept can be a blueprint for others to draw from in future. Canal & River Trust, the wellbeing and waterway charity which looks after 2,000 miles of waterways in England and Wales are the navigation authority on the River Ouse. This is a great project to help even more people enjoy the River Ouse. Our research shows that spending time by water helps make us feel happier and healthier. That’s why we’re working with partners, volunteers and communities across the country to transform canals and rivers into places where people can enjoy spending time and feel better – from boating and canoeing on the water to walking, cycling and fishing alongside. International Year of the Salmon is a collaboration among organisations and countries throughout the Northern Hemisphere. It aims to support the conservation and restoration of wild salmon species, which are under threat worldwide.